Today I have a review of the MAKE UP FOR EVER Pro Sculpting Lip in the shade Carmine Red. It has two sides to it: One with the semi-matte lip color and the other with a powder to cream highlighter. This is the kind of product that will add volume and fullness to the lips once you use the highlighting product. Find out more below! Right now you can get all of this in the new Women's Target Beauty Box for the month of June. You get 11 products/samples for $10. There is also a men's box for the month of June as well. Find out what brands and where to buy below! I recently made a trip to Walmart for a few things that were not makeup related, but I ended up in the cosmetic department anyway and spotted these two things. I found the Makeup Mat and Makeup Cloths on the end caps of the aisles. Honestly the prices were cheap for these so I figured why not and give them a try. Find out more about them and see if they are something you need! Today I have a look at the new Becca x Jaclyn Hill Face Palette from the Champagne Collection that will be launching tomorrow. I was really excited to get my hands on it since I don't own the famous Champagne Pop Highlighter just yet. This gorgeous palette comes with 2 highlighters and 3 blushes that is made for all skin tones. See more photos and swatches below! Aveeno has a new line of Anti-Aging products that will hydrate and improve firmness in the skin. The products in the collection have Blackberry Complex which are infused with vitamins, antioxidants, and powerful anti-aging ingredients. I found the creams and moisturizer to be non greasy and all won't clog the pores. Read on to find out more about which products are my absolute favorites from the collection. Contouring is so popular right now, so it's not surprising that it has now come to the eyes. Kat Von D has these new Contour Quads that comes with 4 eyeshadows that are for base, define, contour, and highlight. The shadows are all matte and there are 4 different quads. I decided on the plum quad since the shades are what I would wear most often. See photos and swatches below! Today I have a look at one of the new Kiko Milano Mirage Lip Stylo Lipsticks. These are pigmented with great color and have a shiny finish. I prefer this type of lipstick finish during the summer months since it can be moisturizing and feel comfortable throughout the day. Also, there are 8 shades in the limited edition collection. See a swatch and find out more info below! Today I have a look at some of the NYX Liquid Suede Cream Lipsticks. These have a matte finish but feel very soft and comfortable. More new shades are coming out soon but right now there are 12 shades available. The three I have are: Orange County, Sandstorm, and Tea & Cookies. See more info and swatches below! Pacifica has a new mascara that sounds like a dream come true. The Dream Big Mascara has 2 brushes in one and lets you choose if you want length or volume just by twisting the top. This is a great feature and I love the magical looking packaging. I was expecting to either love or not love this mascara, but I'm in between. I will explain why below! This post is in partnership with Ontario Mills. All opinions are honest and my own. This month is the perfect time to head over to Ontario Mills Mall and find some great deals on many accessories for spring. 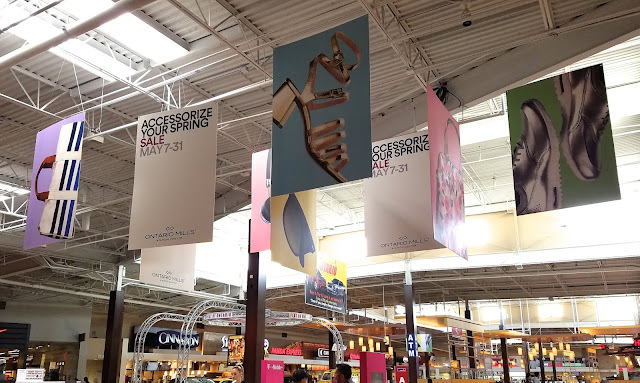 This week I went over there and checked out what was happening during the Accessorize Your Spring Sale Event. From now through May 31st, you can find amazing deals on things like jewelry, sunglasses, purses, shoes, hats, and more. Covergirl has came out with a new lipstick line with Katy Perry called Katy Kat Matte. There are 12 shades in the collection and so far they have been spotted at Walgreens and Walmart. The two shades I have are Catoure and Kitty Purry. They are not going to be completely matte, more of a "demi-matte" is how they are described by Covergirl. See more photos and swatches below! Today I have review of the Luma Hair Brush that will help to straighten hair faster and easier just by brushing your hair. It only takes 60 seconds to heat up and it is best to use it on dry hair. My hair is long, thick, and very wavy. How well would it work on someone with my type of hair? Read on to my review below! Today I have a look at some of the ColourPop Matte X Lippie Stix. There are 15 shades available and I have 4 of them called: Back Up, Cami, Pillow Talk, and Tickler. These are very matte, pigmented, and long lasting. These are probably the softest mattes I've tried and feel the most comfortable. See swatches below!